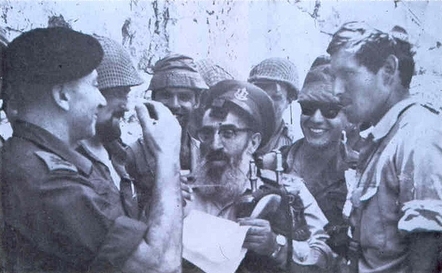 On June 7th, 1967, Israeli Paratroopers liberated the Temple Mount. Although some religious leaders (including, initially, Rabbi Shlomo Goren) favored destroying the Dome of the Rock and building a Third Temple, this idea was never seriously considered. But short of that, what was to be done? There was a debate among the rabbis about how to deal with the prohibition against entering the Holy of Holies. Some proposed simply banning Jews from the entire area. But Rav Goren felt that Jews should be allowed to pray on at least specified parts of it, because otherwise Israel would lose its sovereignty there. the prime minister should declare that the holy places of the Jews be placed under rabbinic supervision. All the Temple Mount is holy to the Jews and therefore it is in the jurisdiction of the Chief Rabbinate even though mosques were built there. Since it is forbidden for Jews and non-Jews alike to enter the Temple Mount the Chief Rabbinate should request the army to close the Temple Mount for everybody. This step should be taken immediately [Goren’s emphasis] before the military curfew is lifted and before free access is given. Now the Arabs are in a state of shock, and their only hope is to stay alive and not be massacred. Now is the moment to set the conditions and basis for the status quo proposed. Through such a step, the exclusive Muslim rule on the Mount will be circumvented. Later it will not be possible to do anything. If this proposal comes from the rabbinate rather than the government it will be seen as a religious matter of holiness rather than a political idea. And since entry will be forbidden for Jews, the Arabs cannot claim discrimination. But Defense Minister Moshe Dayan and Chief of Staff Yitzhak Rabin overruled him. The Temple Mount was placed under the control of the Jordanian waqf and the Western Wall was left for Jewish prayer. Later, Rabbi Goren tried to change the status quo, but many rabbis opposed him as did most of the political echelon. The Temple Mount in effect remained under Muslim control despite theoretical Jewish sovereignty in Jerusalem. Since then, the waqf has excavated and built illegally, destroying archaeological evidence of a historical Jewish temple, and Israel has done nothing. Jews are permitted to go up to the Mount, but may not pray there — a Jew was arrested (by Israeli police) for trying to wave a lulav (a device woven from the ‘four species’ in observance of Sukkot) this week, and Jews have been reported by waqf officials for moving their lips. Any Jewish activity in the area is cause for Arab riots. There is constant incitement of the Muslim population in mosques and by the Islamic Movement of Raed Saleh. ‘Peace’ proposals made to the Palestinians have included sovereignty over the Temple Mount — why not, since Israel has long since surrendered it. Jewish soldiers died to take back all of Jerusalem, not just part of it. Rabbi Goren was right, Dayan and Rabin wrong. Mistake no. 1. On May 20, 1985, Israel released 1,150 Palestinian prisoners, including murderers, in exchange for three Israelis who were captured in the 1982 Lebanon war and who were in the hands of the Popular Front for the Liberation of Palestine-General Command (PFLP-GC) of Ahmed Jibril). Defense Minister Yitzhak Rabin made the deal and Shimon Peres was PM. The agreement set the stage for several others in which either large numbers of terrorists were freed or particularly vicious ones. The recent Gilad Shalit ‘exchange’ (I call it a ‘jailbreak’) included both. This agreement is the worst yet, but the precedent was set in 1985. Now — unless it institutes a death penalty — Israel has entirely lost its power of deterrence against murderous terrorism. Mistake no. 2. In 1992, Yossi Beilin, then Vice-Minister for Foreign Affairs, and some other Israelis secretly met with representatives of the PLO in Oslo, Norway, by authority of Shimon Peres, then Foreign Minister. They agreed — and Peres later signed the agreement — that Israel would recognize the PLO as the representative of the Palestinian Arabs, allow Yasser Arafat to return to the territories from exile in Tunis and form a ‘Palestinian Authority’ (PA) to govern them. In return, the PLO would recognize Israel, and end terrorism and incitement. The agreement was brought to US President Clinton, who then mediated public talks between the parties. The final agreement, signed by PM Yitzhak Rabin and Yasser Arafat on the White House lawn on September 13, 1993, called for a transitional period of up to five years, during which permanent status talks would define an end to the conflict in accordance with UN resolutions 242 and 338 — secure and recognized borders, and an end to Palestinian claims against Israel. The issues of precise borders, the status of Jerusalem, the Arab refugees, security guarantees, and the nature of Palestinian sovereignty were left for these permanent status talks. The agreement was made to the great surprise of the Israeli people, who had voted for Rabin’s platform which called for negotiations with non-PLO Palestinians. Rabin also said that Jerusalem would remain undivided. Once the agreement was signed, however, the government pulled out all the stops to ‘educate for peace’, to overcome the resistance of the great majority of Israelis who hated and feared the PLO. Israel even provided arms to the PLO ‘police’. The US and Europe financed the PA, and the US now trains its ‘security’ forces. Arafat began to break his promises within moments of his return, sponsoring terrorism, ratcheting up incitement, and not changing the PLO charter (to this day it calls for violent resistance against Israel). He turned the educational system, religious establishment and media into anti-Israel and antisemitic propaganda factories. This hasn’t changed under his successor, Mahmoud Abbas. More than a thousand Israelis died in the Second Intifada after Arafat rejected the Clinton proposals at Camp David in 2000. The PLO, which had been discredited, marginalized and exiled, has been resuscitated, and is now trying to get the UN to declare a Palestinian state without negotiating with Israel — in violation of the Oslo agreement that saved it. As a result of the promises of Oslo, the world has come to believe that a partition of territory controlled by Israel is a necessary and sufficient condition for ‘peace in the Middle East’. The pressures on Israel today are a direct descendent of Oslo. Oslo was Mistake no. 3, maybe the biggest. In August 2005, Israel unilaterally unilaterally withdrew from Gaza. The withdrawal was planned and executed by Ariel Sharon, but in December and January he suffered two strokes, the second of which completely incapacitated him, and his deputy, Ehud Olmert, took over. In any event, it was a disaster. Israeli soldiers and police removed Jewish residents, sometimes by force, from the homes they had been encouraged by successive governments to build there. Although they were promised compensation, jobs and housing, many of them today still do not have permanent housing or good jobs. Although every Jewish resident and soldier was removed (even bodies were disinterred from Jewish cemeteries), Palestinians and their supporters still claim that Gaza is ‘occupied’. Greenhouses that were purchased by prominent Jews and other Americans (including Bill Gates) and left to form the basis of a Palestinian economy were torn to pieces. Synagogues were gleefully burned. Terrorism from Gaza in the form of rockets and mortars fired into Israel began almost immediately. Whether Sharon would have been able to deal more effectively with the aftermath is debatable, but Olmert did not respond forcefully. In 2006, Hamas terrorists tunnelled under the border and kidnapped Gilad Shalit. In 2007, Hamas executed a violent coup against PA authorities in Gaza, viciously murdering Fatah (PLO) rivals. They converted Gaza into a base for terror actions against Israel and a laboratory for Palestinian Islamism. By the end of 2008, rocket and other attacks provoked Operation Cast lead. The withdrawal was mistake no. 4. There are other candidates: allowing Yasser Arafat to survive the 1982 evacuation of the PLO from Lebanon, the precipitous withdrawal from southern Lebanon in 2000, the other mistakes that led up to the failure to destroy Hizballah in 2006, the early termination of Operation Cast Lead, leaving Hamas in power, and the Shalit jailbreak. There is no undoing these errors. But there is the possibility of learning from them so as to not repeat them. Update [23 Oct 0653]: Corrected factual mistakes. It was, of course, Sharon who carried out the withdrawal from Gaza in August 2005. This entry was posted on Friday, October 21st, 2011 at 2:32 pm and is filed under General. You can follow any responses to this entry through the RSS 2.0 feed. Both comments and pings are currently closed. The biggest mistake the leaders keep making is under estimating the mentality of muslims and our enemies. Personally, I think its in part because most of these leaders are Askinazim and are not accustomed to living with these people. Any measures we take against them from now on must be strong and so punative it BRINGS BACK of deterence and puts them all on alert that WE are back in charge and refuse to take any more of their threats again! Now that Gilad Shalit is free, I hope Bibi will use exuberant force against any and all attacks and steps our enemies take. Enough is enough! Not listening to Rabbi Goren was a mistake. Certainly the Jibril deal was a tremendous mistake, and too revealed the ability of parents of an imprisoned soldier and the media to manipulate the government. Oslo was a mistake. And of course the pull out from Gaza has turned out to be in one basic sense a mistake i.e. We have allowed one of our worst enemies to have missiles and great destructive power. But the mistake of leaving Gaza also means that Israelis are not patrolling the refugee camps of Gaza. It means that we are not losing soldiers in Gaza. We too do not have direct responsibility for the million plus Arabs in Gaza. And the less Arabs we have under our direct control the better it ideally is for us. We have made mistakes and we will make mistakes. And it is to be hoped that we learn from them , and above all do not make mistakes that truly jeopardize our existence here. But it also important to note that many of the decisions our leaders have to make, and we as a people have to contribute to the making of involve ‘doing wrong no matter what we do’. That is many perhaps even most of the decisions involve paying some kind of price. i would never have done Oslo. And I was against the prisoner exchange to bring Gilad Shalit home. But mistake or not I like most Israelis am relieved and happy that he is back.